A Riesling, a Pinot Noir and a Blend with a Naughty Name, Oil on Canvas 22" x 28"
Clay Pots, Oil on Canvas 11" x 14"
The internet is a wonderful tool for anyone marketing their business. The internet allows me to offer my works to the marketplace via my website, my Face Book account and this Blog. I am able to keep in contact with my patrons, students and fans. I also make my works and activities available to anyone surfing the internet. Thanks to these internet vehicles, I have received responses to my listings. People have contacted me to find out more about where they can see the work on display. They have contacted me to relate their reaction or interest in specific pieces. People have also contacted me to inquire about purchasing my artwork. “Hello, Good day to you over there, My name is Christopher I’m from New Jersey and i hope this message finds you well.I was going through your works and my eyes caught Field Patterns And Roberts Refuge 21″ x 29″, i will like to have it for my new Abode. please let me know if the piece is available, if yes let me have the detailed price and more information about it. i will be waiting to read from you asap. A scam. There are several variations of scam form letters used by these snakes so they become easy to detect. Thanks to the internet social networks, artists are able to easily and quickly communicate and warn others of schemes and scams. To be forewarned is to be forearmed. The tragedy is that these scams can hamper your faith in people. They make you skeptical of legitimate offers from honest people. For now, I will keep painting and take precautions to minimize the chance that I fall victim to any of these scams. Good news. Today I received a notice from the Watercolor Society of Alabama. My watercolor painting, When It’s Ajar, has been accepted to their 69th annual exhibition. 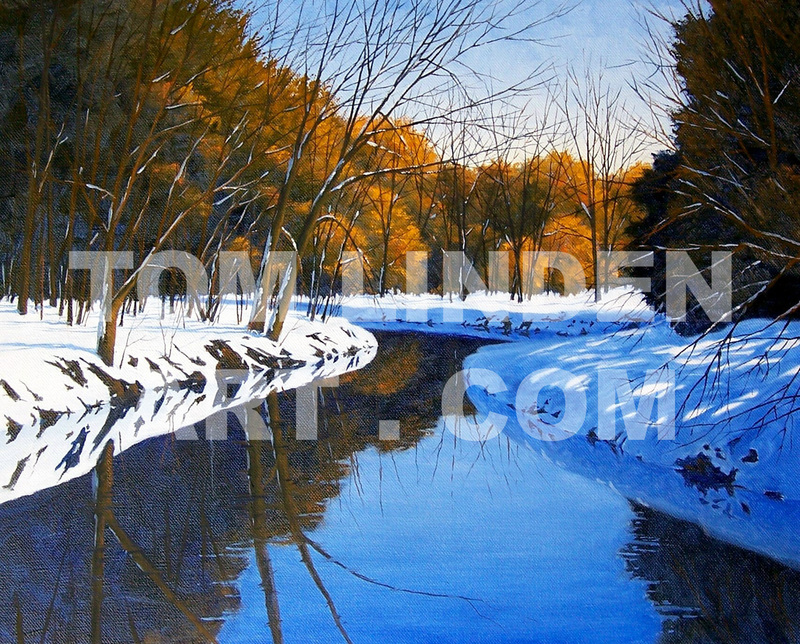 Open Water, Oil on Canvas 16" x 20"
Late March, but the temperatures still lean to the cold side. Last Saturday morning, I went for a ten mile run. When I left the house, the temperature was 29 degrees with 9-10 mph winds. It is hard to believe that it is spring when you are still dealing with wind chill factors. A couple weeks ago, as I was traveling along a two lane road south of Rockford, I crossed a creek. There was still some snow on the banks of the creek but there was no ice in the water. The water was flowing. As I looked at the river, the reflections on the water caught my eye. I took interest in the intensity of the colors in the creek that morning. As I encountered additional creeks and rivers on my trip, I continued to enjoy the deep, rich colors in the waters that day. This experience gave me the idea to go back and revisit the painting Frozen Over (see blog entry dated February 28). I decided to utilize the same design but work with the idea of open water without the surface ice and snow. I aimed to capture that same color intensity which I had experienced in the waters during my car trip. To assist the painting process, I looked through my resource photos. I found a couple river photos that could serve as a guide to help capture the colors of the reflections on the river. This morning I went for a six mile run. 48 degrees with 10 mph winds. Love these warmer temperatures. Now, if we can do something about that wind. 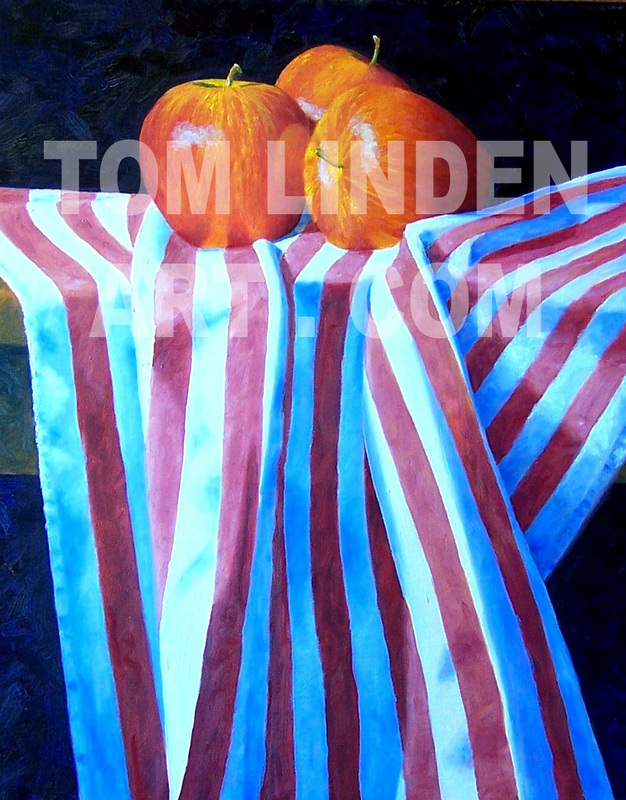 Apples on Cloth, Oil on Canvas 16" x 20"
Although spring officially arrived last weekend, I am already working on arrangements and details for my summer workshops. I am scheduled to conduct watercolor workshops at Rock Valley College in Rockford Illinois and The Peninsula School of Art in Fish Creek Wisconsin. The first workshop is sponsored by Rock Valley College. The workshop will run June 14 -16. Registration will open April 19. The second workshop is sponsored by The Peninsula School of Art in Door County Wisconsin. 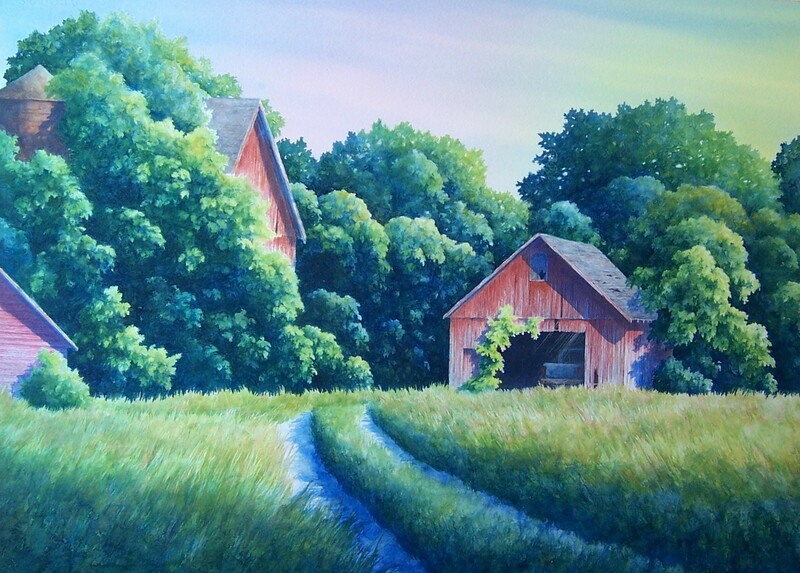 the workshop will run June 24 – 26.
Review new methods and techniques for painting the basic landscape elements common to Door County: water, rocks and trees. to paint along. In the afternoons, you will paint a scene practicing and refining the technique of the morning’s demonstration. You may work from your own reference photographs or those provided by Tom. Students should be able to complete (or nearly complete) a small painting for each day. 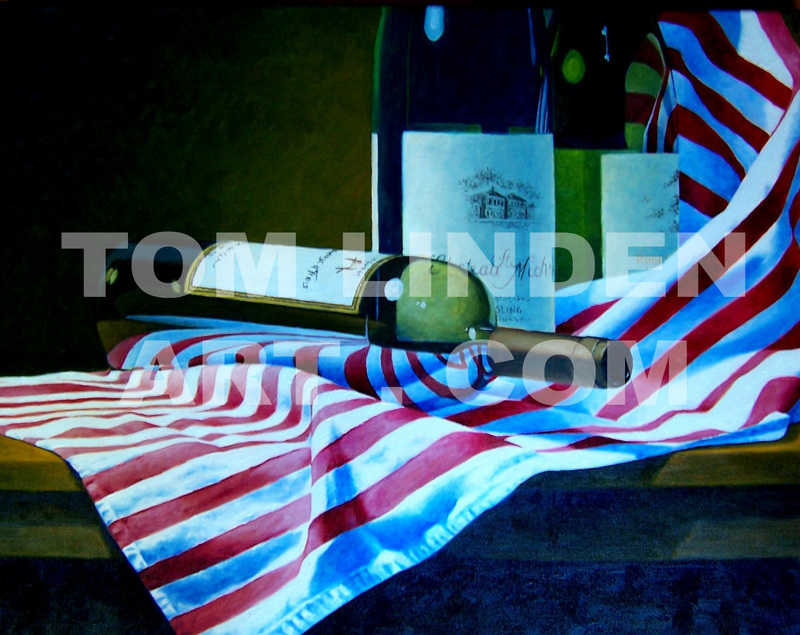 Information can be found on my website, http://www.tomlindenart.com. 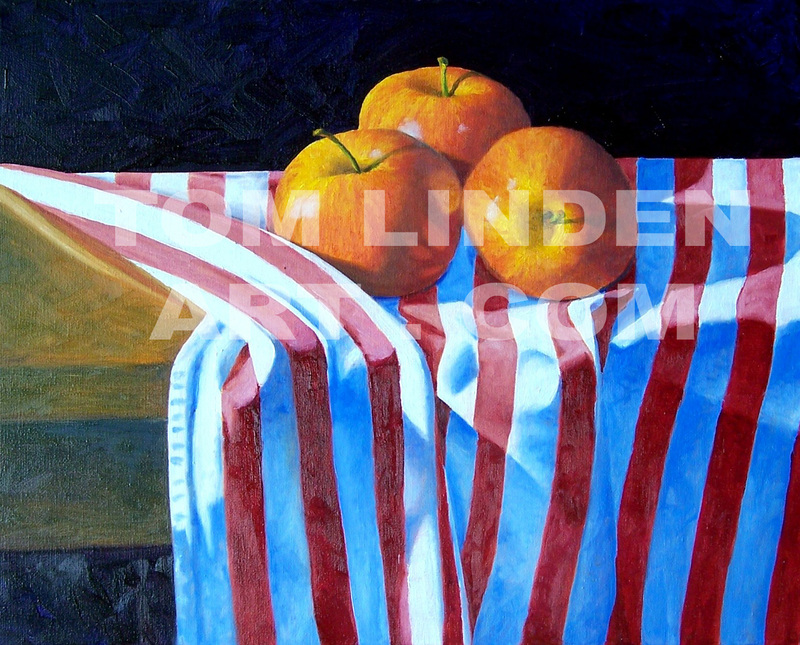 Apples on Cloth, Oil on Canvas 20" x 16"
Oh the life of an Artist and the struggle of time management. The computer is back up again, though we are still working to get everything back to the way it was before the crash. In addition to computer work, teaching classes at Rock Valley College, and, oh yes – PAINTING, there are competitions and exhibitions which require attention. There are also the moments of “Murphy’s Law” – the theory that anything that can go wrong, will go wrong. In early February, I sent my submissions for a fine arts festival in a community approximately 60 miles away. The festival is scheduled to run April 1 -30. The prospectus indicated that notification of acceptance would be issued by March 1st. Saturday March 6th I received notice that two of my works were accepted to the festival. Here is where the Murphy’s Law stuff starts. The framed works must be hand delivered to the exhibition site between March 9 – 13. Oh oh, both works are newer oil paintings for which I do not have frames. Both paintings are sized differently from any other paintings, therefore, I cannot borrow frames from other works. I need to order frames and fast. On Monday morning, March 8 at 7:50am, I am on the phone with a sales rep from the company I utilize for my frames. The rep understood my need to assure that the frames would be available to ship promptly. The rep checked stock and seemed confident that the order would be assembled and shipped by Tuesday afternoon, Wednesday at the latest. Okay, that’s tight but I might actually have the frames here in time to deliver the works on Saturday. Keep my fingers crossed. Oops. Murphy’s Law. Late Wednesday afternoon, while painting, I receive a telephone call from the frame company. They claim that the material that is in their shop is defective. I can either wait for new stock to arrive by, maybe early April or I can cancel the order. Some sales organization. No other options. Could you make an offer to help me out? Any other frame styles which are similar? Cancel the order. Oh well. Spent Wednesday evening (no classes – spring break) cruising the art shops and craft stores for decent frames. No such luck. Back at the studio, I decide to check on frames from a company which provides most my art supplies. Found something which seems acceptable, though I have no idea how these frames actually look. Oh please have good inventory. March 11, Thursday morning by 8:00am I am on the telephone with North Carolina. They have inventory on the two sizes required. Great. The order might be able to ship Thursday but most likely not until Friday. Okay. Let me place my order. By the way, do I need to order Offset Clips to hold the canvas painting in place or are the clips included with the frame? The rep doesn’t know, the computer description does not help, she will ask someone. Ouch, this isn’t looking too good. The rep returns a few moments later assuring me that all (repeat ALL) hardware is included. Oh could this be? I called the head of the festival to indicate that I might need an extra day or two to get the paintings delivered. Not a problem, if I can get the paintings delivered by Tuesday March 16 – please. Okay, except for the computer thing, my luck seems to be changing. But then again, there is Murphy’s Law. UPS delivered the frames around 3:00 pm Monday March 15. I carefully pulled the frames out of the box. The frames look better than I anticipated. This will work. Oops. Wait. Where are the Offset Clips to hold the artwork in place. Just like common sense and empathy in Washington D.C. – not there. Made a couple telephone calls. A local craft store has a few of the Offset Clips available, including the size I need. Helen offered to go pick up the clips so that I could get all my gear together for the evening class. Oh, you didn’t think that I was done with the Murphy’s Law stuff, did you? No. The exact clip that I needed was not actually in stock (inventory was on the wrong hook). Helen picked up the closest size possible. As an artist, especially one in trouble, you bend and twist and shim as necessary to get the job done. The paintings look great (my opinion), and more important, were successfully and without further incident delivered on Tuesday morning. Except, in my rush to get the works framed and delivered, I neglected to include my Artist statement with the paintings. Oh well, Murphy’s Law. 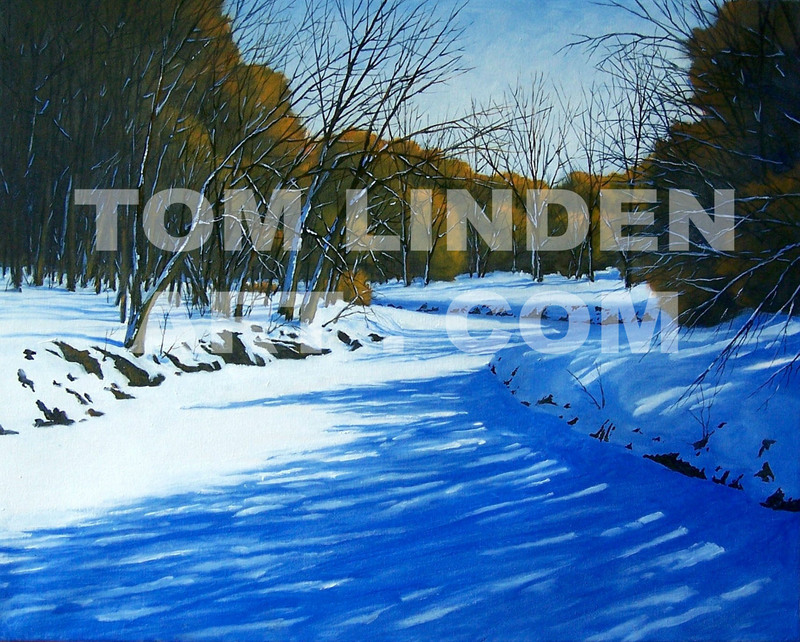 Frozen Over, Oil on Canvas 16" x 20"
Sorry for the delay in getting the next entry published. Some fun loving being out there was nice enough to generate a trojan virus which our computer has now adopted. Any work on the computer takes an eternity to process. We are working to get this repaired. In the meantime, I am afforded a few minutes of time at our local library to at least forward the latest landscape work. Frozen Over was finished just in time. We now have warmer weather. The streams and rivers are losing their ice, formations of geese are flying north. I saw Robins at the bird bath last week (looked twice as I thought that they might be Sparrows with chapped chests- but they were Robins). Mid April will be busy. 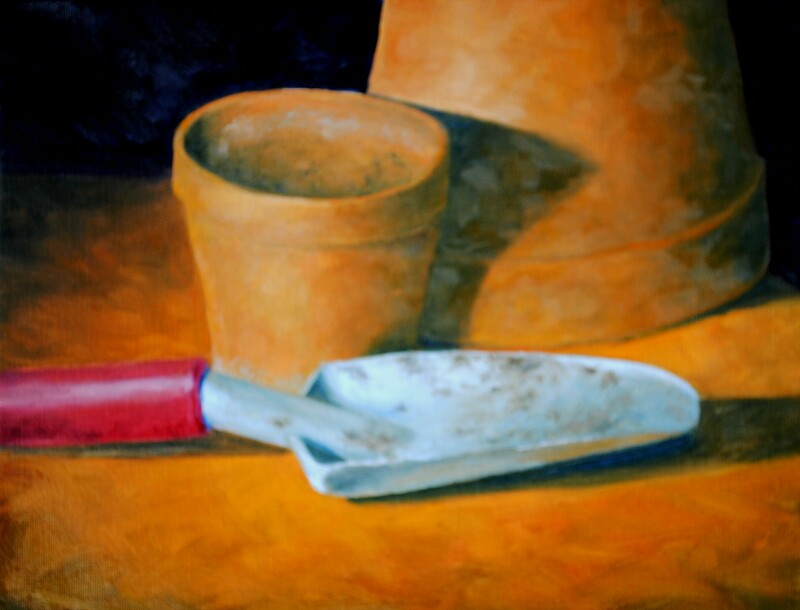 I will be diplaying Oil paintings at Rockfords ArtScene at Bennies Cleaners on April 16 and 17. I plan on attending exhibition events at the Kaneland Festival of the Arts on Sunday April 18 at 11am and Watercolor ’10 at the Norris Gallery in St. Charles at 2pm. More details to follow. If you desire to attend and need additional information, please contact me at sales@tomlindenart.com. Overgrown, Watercolor on 140# CP Paper 21" x 29"